Can you please assist with translating a Varniai death record? his body was burried by the canon priest Juzumowicz, Varniai parson on the 23rd day of june in Vorniai parish cemetery. 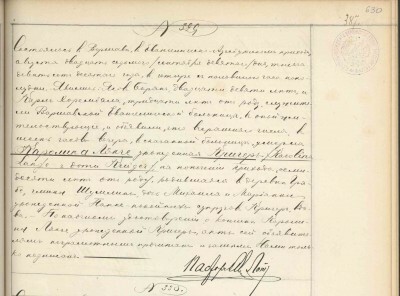 I would really appreciate a translation of the following death record of my great grandmother Karolina Krüger from Warszawa from 1910 # 329. I hope to be able to confirm my assumption. I was wondering if you maybe missed my request. I'm hoping for her maiden name (Tank/Tang) as well as where she was born, so I am sure "she" is the one I'm looking for. It happened in Warsaw in Evangelical-Augsburg parish on the 27th day of August/9th day of September 1910 at 4.30 p.m. Appeared: Jakub Baran, 29 years old and Karol Horembała, 30 years old, workers of Warsaw Evangelical hospital, both living in this hospital and they informed that yesterday at 6 p.m. died in this hospital Karolina Lange nee Kruger, she was under the care of the parish, 70 years old, born in the village Grabie located in Szumlin community, daughter of Michał and Marianna nee Panke, late spouses Kruger, widow. After eye belief about Karolina Lange nee Kruger death this act was read aloud to the illiterate declarants and signed only by Us. It happened in Warsaw in Holy Cross parish on the 10th/23rd day of November 1901 at 7.30 p.m.
Władysława Delfina Fertner, a miss, living with her parents in Warsaw in the house number 2779ab at Aleksandria street, born in Warsaw, daughter of spouses: Antoni Fertner and Tekla Fertner nee Romanowicz, 24 years old. this marriage was preceded by 3 banns announced in St. Cross and St. John parishes on the: 21st day of October/3rd day of November, 28th day of October/10th day of November and 4th/17th day of November of the current year. Religious marriage ceremony celebrated in St. Joseph church by the priest Józed Mężnicki, teacher of the law of God in my presence, priest Kazimierz Matlanowski, St. Cross parish vicar. This act was read aloud and signed by Us, newlyweds and witnesses. Thank you for the translation. Is there a "Year" when this marriage took place. Thank you so much for your help and translation!! I really appreciate it. I'm now wondering if the pastor who signed the record maybe just wrote the last name wrong, instead of Tanke he wrote Panke?. Thank you Marcel for the clarification. 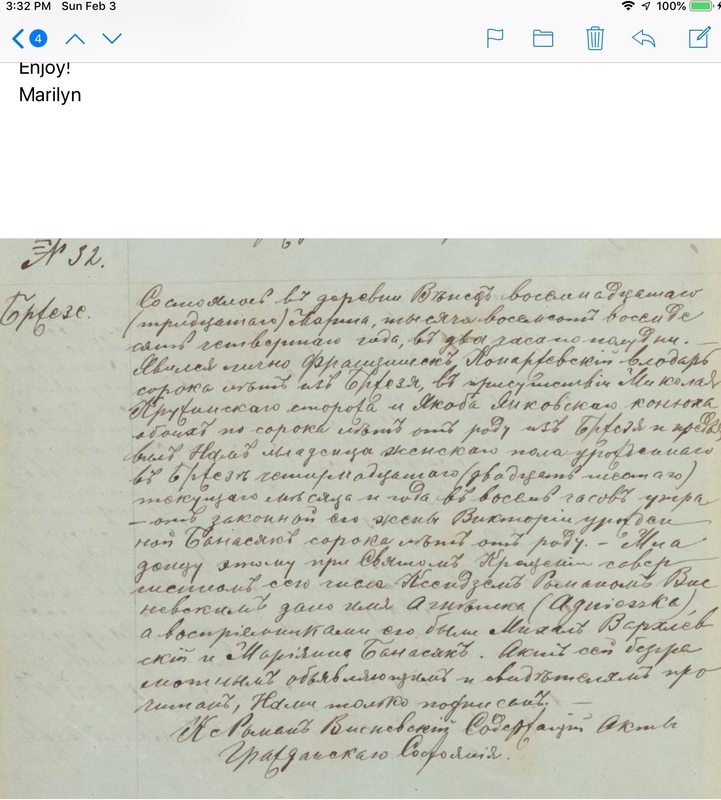 I would greatly appreciate it if you might translate this next document. It is #32. 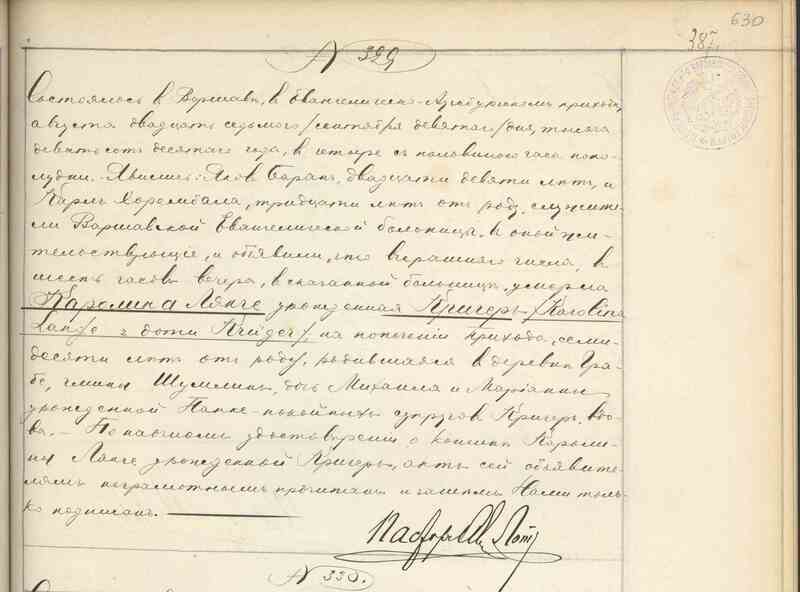 It is the birth record for my great grandmother, Agnieszka Konarzewska. Her parents were Franciszeka Konarzewski and Wiktoria Banasiak. I am trying to figure out where she was born. 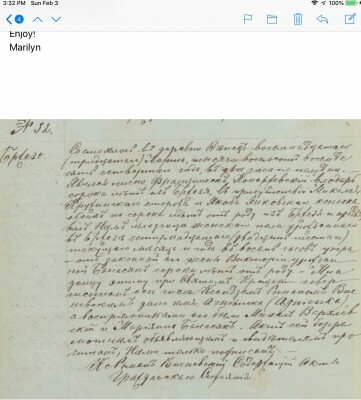 I was hoping you could translate this marriage document #59 between Jan Galecki and Agnieszka Konarzewski. They are my great grandparents. It would be greatly appreciated. I am coming to Poland, and using your tour company, to go to the villages of my family once I know where they are from. Agnieszka Konarzewska, 17 years old a miss, born in the village Brzezie, located in Wieniec parish, Włocławek county, living with her mother, daughter of spouses: late Franciszek Konarzewski and living daylaborer Wiktoria Konarzewska nee Banasiak living in the village Miechowice. This marriage was preceded by 3 banns announced on: 15/28 October, 22 October/4 November and 29 October/11 November of the current year announced in Brześć and Kościelna Wieś parish churches. Bride's mother, present during writing this marriage act, gave oral permission for the marriage. Religious marriage ceremony celebrated by the priest Jan Chyliczkowski, Brześć parish parson. 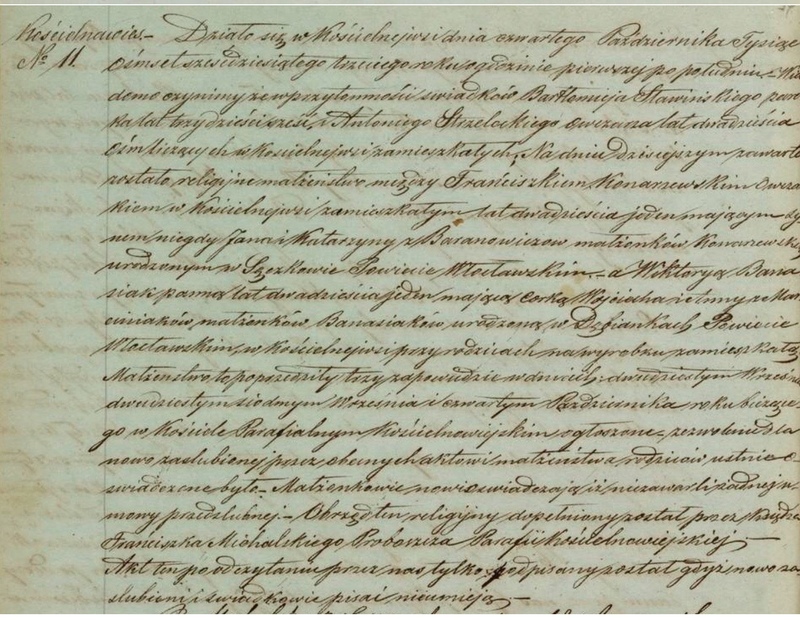 priest Jan Chyliczkowski signature, serving as civil registrar. It happened in the village Wieniec on the 18th/30th day of March 1884 at 2 p.m. Appeared in person Franciszek Konarzewski, municipal steward, 40 years old from Brzezie in the presence of Mikołaj Krużyński, watchman and Jakub Jankowski, horse boy, both 40 years old, from Brzezie and presented Us a female child, born in Brzezie on the 14th/26th day of the current month and year at 8 a.m. with his legal wife Wiktoria nee Banasiak, 40 years old. At The Holy Baptism held today by the priest Roman Wiśniewski the child was given the name Agnieszka and the godparents were: Michał Warchlewski and Marianna Banasiak. This act was read aloud to the illiterate declarants and witnesses and signed only by Us. 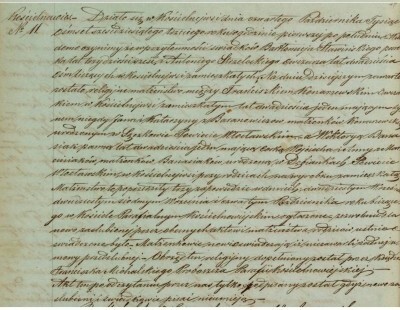 priest Roman Wiśniewski signature, serving as civil registrar.